This lovely lady caught my eye as she rode along in short brown skirt, knee highs, blouse and shades. I've been thinking about handle bars lately. Which style is most comfortable? Hers look good, but probably only for around town. I started riding a 10-speed in high school with standard drop bars. When mountain bikes came into style, I was thrilled to be upright. More recently, I started doing long (30-100+ miles) recreational rides with drop bars again, and I get a pinch between my shoulder blades that no amount of bike fitting seems to fix. I'd love to hear your suggestions. I also have moustache bars mounted on my city bike and it looks pretty sweet. For 30-100+ miles you're got to have drops. I had a similar issue with my beloved French road bike which was completely eliminated by a professional bike fitting and the resulting new stem. I have to say that the $100 spent were WELL worth it. I have a new old bike for going 100+ miles and will be getting a fitting for it before spring. I'm a mustache bar guy, myself. Hi! I read your blog all the time, even think I see you out paparazzing bicyclists from time to time on Valencia. I'm building my girl a bike and we've been discussing the handlebar question too. My opinion is that most people would be happier most of the time with some form of swept back bars like the aformentioned albatross, or moustache bars. My touring ring has moustaches, and the ability to sit up in the saddle without having your hands so close together that you lose control is valuable.Being able to extend your arms and lower your torso in order to recruit more and better leg muscles when you're just churning out the miles is also important though. It seems to me that town bars are as you say better suited to "just get me there" short rides, while those of us who spend more time in the saddle need the hand positions, and saddle positions afforded by moustaches, or drops. The reason I go with moustaches over drops is the position of the shifters. 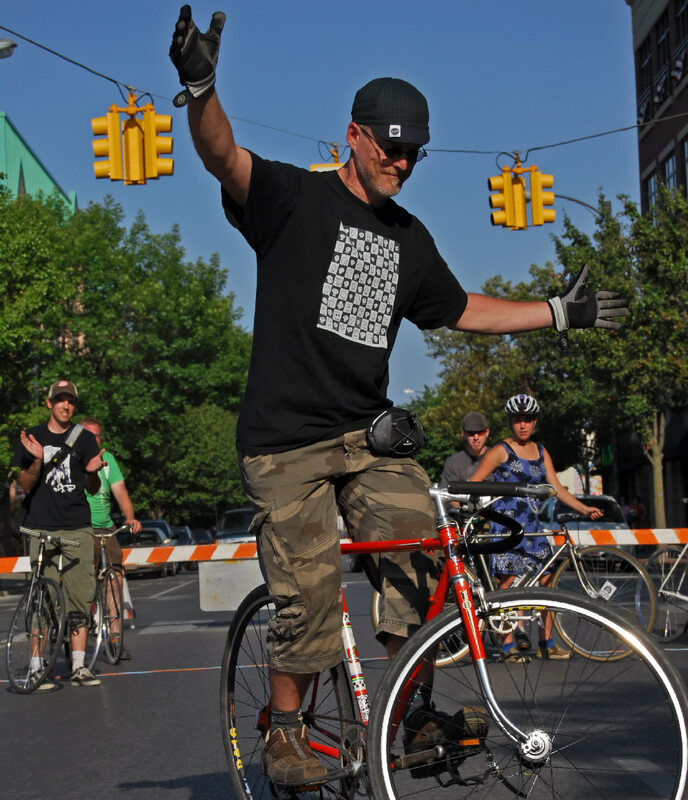 I run bar-ends fanatically, and I don't want to have to "get in the drops" just to shift down at the redlight. Flats are another story though. They make my hands tired, but they are great for jumping the front wheel up onto curbs, stumps, and popping wheelies. I think it's got something to do with the way the bars land in your palms when you hit the ground. It's much more controllable than other hand positions. But unless you're trying really hard to be cool like that, flats are just going to give you carpal tunnel. Check out the new Belleville Bars at Velo Orange (velo-orange.com) They're great - put a pair on my singlespeed road conversion and loving them. I've ridden albatross bars on my touring bike, commuter and folding bike for years and ridden centuries with them on my touring bike. What you give up in aerodynamics you gain in comfort over the course of a day. They also work nicely upside down. I like moustache bars for town riding and up to about 30 miles. Above that, I ride with drop bars. I can't really imagine a change in bars is going to be the thing that helps you. Maybe a slightly higher stem? A shallower drop? Were you doing 30-100 miles without the discomfort using another kind of bar? What kind? I have a theory about bike fit. I believe that most components on the bike need professional fitting(seat height, angle of the seat, crank length etc...), but the height of the bars need to be specifically thought out and decided on by the rider of the bike(its your lower back and shoulders).However, I think bar-width IS a fitting issue. Try a different height and length of stem. Or before a fit visualize the position that you want to feel when going for a long ride that would make your body more comfortable, so you have an idea what you want your fitter to do. For your problem, I'm leaning on the idea of a taller stem. Also, are you changing your hand positions much while on a long ride? Sometimes going a couple of miles while placing your hands in a couple different positions on the bar can alleviate the pain by causing the problem area to get some added blood flow. I used to get the same pinch between my shoulder blades on drop bars, after a professional fitting i was shown narrow profile drop bars. Seriously they have changed my life! no more pinching, my hands go directly to the right spot every time, who would've thought bars a little bit narrower than normal could make such a difference? Oh and if you have small hands (as I do) go for short reach levers too so you can grab your brakes easier. I have them on my MTB, Expedition Bike, Road Bike; they took me 44000km around the world. Very common in parts of Europe, but rarely seen elsewhere. As you may have guessed, I love them. Good luck!